This past weekend, Gamestop expanded their horizon to provide customers with even more gaming selections, and to include blast from the past classics on an array of many different retro consoles. Gamers worldwide wanted to see a revive of the virtual vintage world, and Gamestop answered. Now retro fans get the chance to play their favorite original games like Mortal Combat, Super Smash Bros, Super Mario, and more, to reminisce upon fond memories of gaming as a child or young adult. 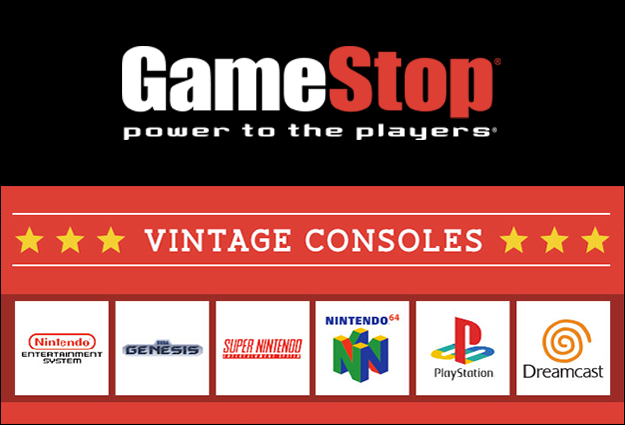 Currently Gamestop carries and sells original Nintendo, Sega Genesis, Super Nintendo, Nintendo 64, original Playstation, and Sega Dreamcast games, consoles, and console accessories such as controllers and memory cards. The games that Gamestop carry are being sold based on popularity and content, so expect to see a range in pricing and availability in stores and online. Also, all of the games and consoles being sold are pre-owned, so be mindful of that. Not all of the games and consoles are available for online purchase, so a trip to a local Gamestop retailer might be preferable. As far as how extensive the retro selection will get at Gamestop, we do not know yet. Ebay may still be an option if you are looking for a less popular game. One thing is for certain though, no matter where you go to buy retro, you will pay a good amount of money for it because of the current demand. According to Alex Newhouse on a recent Gamespot.com news post, "The most expensive games include: Conker's Bad Fur Day for the Nintendo 64 priced at $79.99, Suikoden II for the PlayStation priced at $89.99, and Cannon Spike for the Sega Dreamcast priced at $79.99." It is really great to see Gamestop reviving the retro gaming scene not only for the memories some of us have, but also to serve as a way to say, "Hey, look how far we have come." Technology in gaming has advanced tremendously in the past 10-20 years, and it is baffling to think what it will look like in the same time frame from today. So with that, are you excited to see retro games making a comeback? What is/was your favorite retro game? What retro items do/did you own? Post your comments below.